How refreshing is a little bit of color against the gray of this winters day. How the rain outside makes these hues shine brighter than they would have another day. How much I have always craved this very thing. The brightness and beauty of color on a drab day, week, month, wall, room, house, shirt, dress. The world outside dark and gray….and the world inside (though beautiful) chaotic, full and maybe a little bored, until the creating (and color) of something took the attention away to another place. A place of calm and delight. A place of creating. A place where I have always been meant to be. This recipes, although short and simple, was all about the creation of something beautiful and much less about the eating of something delicious (for me anyway). Since I have been on a strict diet of no sugar there really wasn’t a bite of this I could eat but I didn’t seem to mind and in fact somehow in the process I was happily distracted from the food:) Instead of looking at all these gorgeous pieces of art in front of me as edible delights, I looked at them as shapes in greens, yellows, browns, whites and oranges. Just colors waiting to be created with and then captured in a photograph. Just pretty things waiting to be transformed into other pretty things…Oh how I enjoy this very thing! And oh how my family enjoyed eating it! This dessert recipe is an easy go to sweet treat because it can be made ahead and customized to your liking. I used winter pears and dried apricots but it could be adapted to any season with the change in fruit. You could add in or exchange fresh peaches or apricots....or you could add different dried fruits like figs, raisins or cranberries. Into the cookie crumble you could add pecans or slivered almonds for a little extra crunch and texture difference….or you could add in a few fresh berries for some pops of color. In exchange for the ice cream you could use whipped cream or creme fraiche depending of the level of sweetness you are looking for. There are so many options…all of them lovely…and all of the easy! 1) Place water and sugar in saucepan. Heat until boiling, stirring often until sugar is dissolved, reduce heat. 2) Add pears, lemon and cinnamon stick. Cover and simmer for 20-25 min. 3) 5 minutes before pears are done, add apricots and continue to simmer. 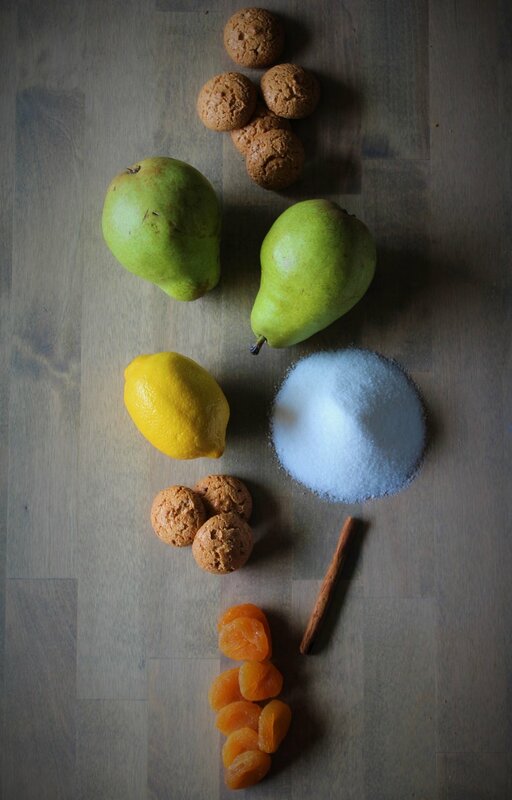 4) When pears are done remove lemon and cinnamon stick. Let fruit cool at room temperature in cooking liquid. 5) Serve at room temperature or cold. Top with ice cream, creme fraiche or whipped cream. Sprinkle with crumbled amaretti cookies.